SISD is a Club. It is in a Region of the United States called the Desert Coast Region (DCR). Geographically The Desert Coast Region includes clubs located in San Diego, Orange, Los Angeles and Imperial Counties in California, and in Yuma, Arizona. The Desert Coast Region is so large that it is unique in having 3 Districts. Each District, is color-coded, and identified with Roman numerals: DISTRICT I through III. 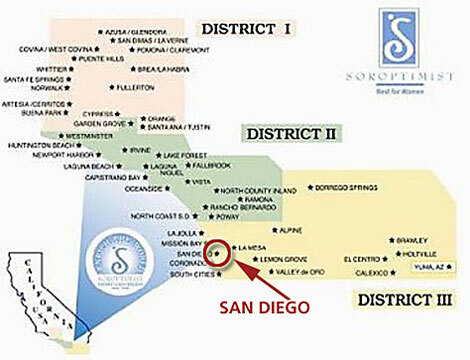 SISD is in District III (shown at the bottom in yellow), with San Diego circled in red. The smaller names on the graphic identify the clubs in each of the three the Desert Coast Regions. 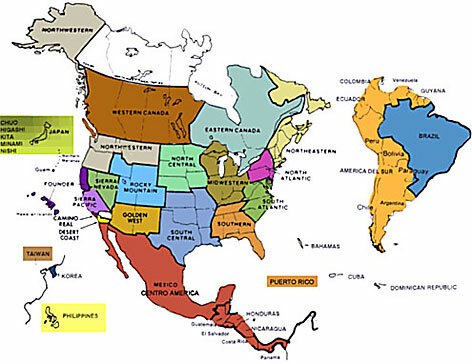 Four Federations geographically cover all Regions worldwide, (called Unions in Europe), that in turn cover Districts (in California), and all SI Clubs. SISD is in the Soroptimist of the Americas Federation (SIA) that is headquartered in Philadelphia, PA. SIA covers a huge geographical area: North and South America, Central America, Japan, Philippines, Taiwan and Puerto Rico. The remaining three Federations are Great Britain and Ireland (SIGBI), Europe (SIE), and South West Pacific (SISWP). SI is also represented on the Board of the Conference of Non-Governmental Organizations (CONGO). In this capacity SI works actively with non-governmental organizations such as the Red Cross to promote all changes necessary to make the world a better and safer place for current and future generations of girls and women. SI is governed by an international Board that meets annually, usually in August. The Board is comprised of three representatives from each of SI's four Federations, and four International Officers: President, Immediate Past President, President-Elect, and Treasurer. SI holds an International Quadrennial Convention (every four years). The 2011 Quadrennial Convention was held in Montreal, Quebec, Canada. The 2015 Quadrennial Convention will be in Istanbul, Turkey. Attendance is open to all SI members in good standing. All Federations operate under the SI Constitution, although each Federation has its own internal structure, by-laws, policies and procedures. Federations have Biennial Conventions. SIA, to which SISD belongs, held its 2010 Convention in San Francisco. In 2012 it was in Honolulu, HI. In 2014 it is in Vancouver, British Columbia, Canada. Federations are divided into Regions. SISD is in the Desert Coast Region (DCR) of SIA. Regions have yearly Conferences. DCR is further divided into Districts. SISD belongs to District III. Districts have two meetings a year, a Fall meeting in October and a Spring meeting in February. Finally, we are down to the Clubs, which are always abbreviated preceded by the SI designation, as in SISD. Clubs also have their own by-laws, policies and procedures. 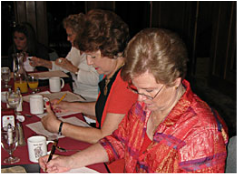 So, as a club member of SISD you automatically belong to SISD, a Club, to a District (III), a Region (Desert Coast Region-DCR), a Federation (Soroptimist of The Americas-SIA), and Soroptimist International (SI). Quite a mouthful. Be proud, Soroptimists! 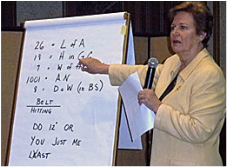 The flow of the Soroptimist Organization, from Soroptimist International, through the Federations, to Regions (called Unions in Europe), to Districts (in California), to Clubs and then members. There are currently clubs in 130 countries and territories, with approximately 120,000 members worldwide. This chart identifies the European use of 'Unions', rather than 'Regions', as well as other minor Federation variations. But the function is identical. Countries under the umbrella of SIA, to which SISD belongs. SISD's Victoria (Vicki) Hobbs, who has participated actively several times in both SIA and SI gatherings. She was Vice-Chair of the Montreal Convention. 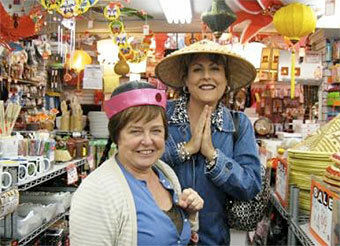 President Karen Burrows and District III Director Judi Dunnigan in San Francisco's Chinatown during the SIA Federation Biennial Convention, July 2010. SISD member Vicki Hobbs presenting at the San Francisco Biennial SIA convention. Looks a little like Greek to we members who weren't there.